This article by Thomas Rippeth, Bangor University was originally published on The Conversation. Read the original article. 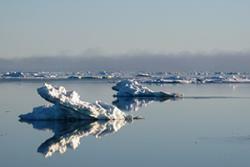 Image credit: Ben LincolnThe Arctic region is warming up twice as fast as the rest of the planet. 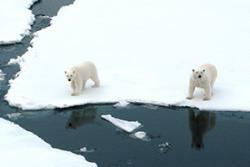 This rapid temperature increase has caused record-breaking seasonal retreat in Arctic Ocean sea ice in recent years. The latest minimum recorded was set in September 2012, while the sea ice cover in September 2016 tied with 2007 for the second lowest extent ever recorded. And it’s not just coverage that’s the problem, sea ice is also thinning, with a current average thickness of 3.2m in the Central Arctic. Image credit: Ben LincolnThe Arctic is pretty unique compared to the world’s other oceans and seas: it is a very quiescent (that is, inactive or dormant) ocean with low levels of turbulent mixing. The very low levels of turbulence are attributable to a combination of weak tides and the presence of sea ice, which dampens out the influence of the winds in driving ocean currents. This lack of activity supports the isolation of the Atlantic water heat from the sea surface. 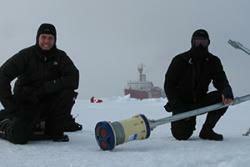 Deploying equipment through the sea ice. : Image credit: Ben LincolnThe measurements were made by dropping a torpedo-shaped instrument off the back of the ship – which collects small scale data on changes in the current speed as it drops – to estimate turbulence. This information was then combined with ocean current measurements made from an instrument line suspended through a hole in the ice.